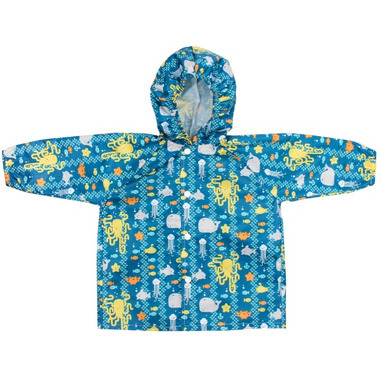 Little ones won’t want the rain to go away when they get to wear their Bumkins Rain Jacket. 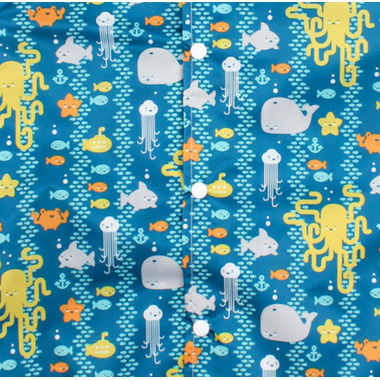 Made from Bumkins’ signature waterproof fabric, Rain Jackets are available in a variety of colourful Bumkins prints. Sized to fit 6-18M and 18-24M, Rain Jackets have a snap closure and elastic around the cuffs and hood to help keep the rain out. A dart in the back allows little ones ample room to jump and splash in puddles, and afterwards, the durable, machine washable fabric is easy to clean. Lightweight and packable, Rain Jackets can be folded up to fit perfectly in a Bumkins Large Snack Bag! Small (6-18 Months) Rain Jacket measures approximately 29” from cuff to cuff, 15 ½” from the shoulder down, and 14” across the chest. Medium (18-24 Months) Rain Jacket measures approximately 34” cuff to cuff, 19” shoulder down, and 15” across the chest.